The Asylum Seeker Resource Centre (ASRC) is Australia’s largest provider of aid, advocacy and health services to people seeking asylum. Founded in 2001, the Centre has been a place of refuge and hope to more than 10,000 members, and currently services more than 2,000 asylum seekers. All people seeking asylum have their human rights upheld and receive the support and opportunities they need to live independently. 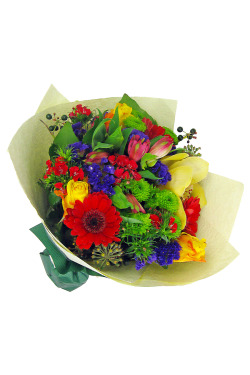 This month we have selected our popular Posy to raise funds for the ASRC. We hope this fun mix of flowers will brighten up someones day and the funds raised will empower asylum seekers to reach a bright future in Australia. The ASRC has grown to include 30 programs that strive to protect, support and empower Australia’s wider asylum seeker community. All programs are based on the following core services; food and material aid, health, legal, employment, education and training, social and community development and social enterprise.